Dos Amigos is the passion project of two Cornell students from the West Coast. David and Jorge were disappointed in the lack of authentic Mexican cuisine in Ithaca, so they decided to roll up their sleeves and teach people what a real Cali-Mex taco tastes like. And this isn't your regular taco. David and Jorge spent months developing the most authentic recipes. Though they both spent their childhoods gorging on street tacos, Jorge ventured to Mexico to ensure that they stuck to their roots. These guys aren't kidding around. 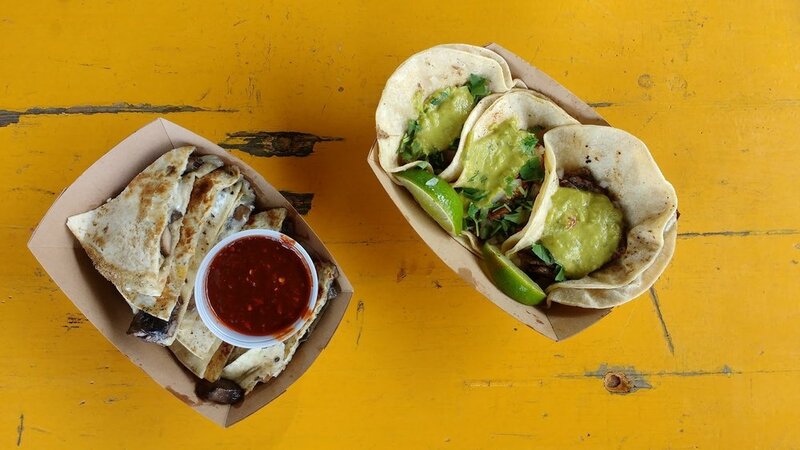 And for those too chicken to dive headfirst into a Dos Amigos taco, we've got some tamer choices. Definitely not tamer in flavor, but you can get away with eating these options with a fork. We've also spent just as much time perfecting our meat-free recipes as our animal proteins, so vegans and vegetarians rejoice! Did we mention we have dessert? Corner of Eddy St. & Dryden Rd. David and Jorge labored over her, inside and out. It's got an interior that would make Walter White drool, with a spankin' new paint job by a local art student with California roots. The Dos Amigos team made sure to keep in line with the most important part of the business: the food. Like the cuisine, the truck has Southwest flare, covered in bright colors and passionate illustration so you don't just know what you're eating, but where it's coming from. With great Cali-Mex comes great responsibility, and Dos Amigos doesn't take that lightly. Come and find us late night on the corner of Eddy St. & Dryden Rd. Corner of Eddy St. and Dryden Rd.